Egyptian airport security deports PA official Jibril Rajoub, who in the past called to use nukes against Israel. Egyptian airport security on Monday denied entry to senior Palestinian Authority (PA) official Jibril Rajoub and deported him, sources at Cairo airport said, according to the Reuters news agency. Rajoub, a confidant of PA chairman Mahmoud Abbas and a high-ranking member of the central committee of Abbas's Fatah movement, was told he was on a no-entry list and put on a flight to Jordan, the sources said. The sources gave no other reason for the deportation of Rajoub. Fatah official Monir al-Jaghoub said on his Facebook page that Rajoub had been invited by the Arab League to attend a conference in Cairo on terrorism. Neither Egypt's foreign ministry nor Rajoub could be reached for comment. 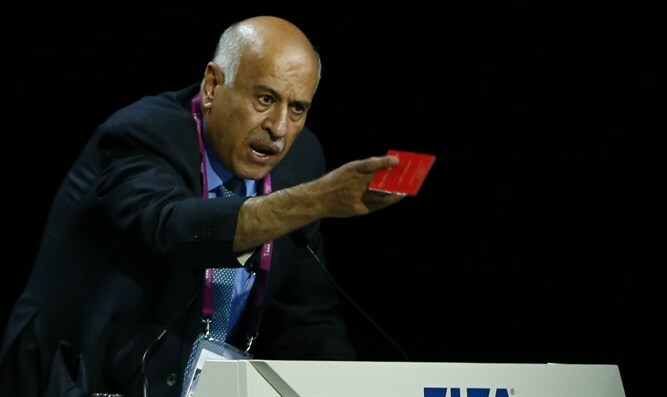 Rajoub is a former head of PA intelligence who now leads the Palestinian Football Association and is responsible for efforts to have Israel sanctioned by FIFA. Rajoub has in the past said that Jews deserved the genocide inflicted on them by the Nazis, and prior to that declared that if the PA had a nuclear bomb, it would use it against Israel. His deportation is surprising, given that the current Egyptian government has generally had better relations with Fatah than with the Hamas terrorist group that controls Gaza.